Sometimes a small engraving order comes in, literally very small. The request was for a branding stamp with a diameter of 8mm, to be engraved. 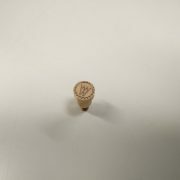 The engraving consists of a gear wheel along the outer rim and in the middle a logo of 3 W’s against each other. With a 0,1mm cutter we milled the engraving. The result is shown on the photograph. 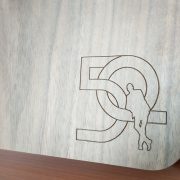 As you can see: everything around the logo has been milled away, so that the logo itself was liftedhigher. This way only the logo makes contact with the material to be branded. To the back of the branding stamp there is screw-thread in order to fit on top of a soldering iron. 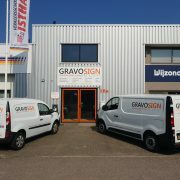 From 01-05-2018 we continued on as GravoSign, formerly Gravure Den Helder. There is much ado with a name change. Beside informing our suppliers and customers, our name also has to be changed everywhere it is mentioned on line. However, it was time for something new, for the name “Gravure Den Helder” no longer covered all our procedures and products. We do much more than just engraving, plus we deliver not only in Den Helder, but throughout the whole country. To top it all, we changed our house style: window frames and doors were painted, the stickers of the signs were changed and the company cars got new lettering. Aluminum front panel for a model train. An enthusiastic model builder came in with the question whether we could make a front plate for a control panel. He had drawn up a schematic representation of his self-built train track, including locations and dimensions for the buttons and switches. 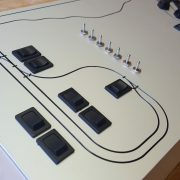 We milled the lines and then wrapped them in black lacquer. In addition, all round and square holes have been milled out with great accuracy so that the knobs and switches fit exactly. The question of whether he wanted to mail photos of the end result was answered with an enthusiast “Yes of course!”. https://gravosign.nl/wp-content/uploads/2018/04/Aluminium-Frontpaneel-treinbaan.jpg 1080 1920 Jeffrey https://gravosign.nl/wp-content/uploads/2018/01/logo.png Jeffrey2017-11-10 11:50:442018-11-30 11:56:24Aluminum front panel for a model train. Laser engraving of luminescent book. This light book was a gift for someone who turned 50 years old. It is a wooden light book, also known as ‘Book lamp’. When you open the book, light shines through the pages which if you put it open results in a beautiful lamp. To personalize the gift, the question was whether we could put an engraving on it. The customer showed a photo of the man, who was photographed in a modern ’50’. We have converted the photo to clean lines so that it could be engraved in the book. We had chosen to burn the image in the wooden book with our CO2 laser. The laser gives an extremely fine and accurate engraving, which is clearly visible on the photo. https://gravosign.nl/wp-content/uploads/2018/04/Lasergravering-houten-boek.jpg 1080 1920 Jeffrey https://gravosign.nl/wp-content/uploads/2018/01/logo.png Jeffrey2017-11-02 11:50:442018-11-30 12:00:12Laser engraving of luminescent book. 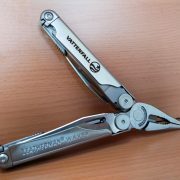 “Can you also engrave a logo in a Leatherman Multitool?” That was the question of a customer that wanted to give it as business gifts. He wanted the company logo engraved in the Multitools to personalize it. There was, however, a tight time-schedule because the next day they had to be sent out. After some e-mails back and forth about the location and size of the engraving we went to work. The Multitools were made from hardened steel, which made our choice to engrave it on the Fiber laser. The top layer of the metal is burned in by the extremely fine and powerful laser beams. This gives a nice contrast and is indelible. The next day the customer picked up the boxes again and thanked us for the fast service and the wonderful result.